Los Angeles Dodgers left-handed pitcher Clayton Kershaw was named the 2014 National League Most Valuable Player today in voting conducted by the Baseball Writers Association of America. Kershaw earned 18 of 30 first-place votes and nine second-place votes, garnering 355 total points. The 26-year-old becomes just the fourth Dodger pitcher to win the Most Valuable Player award, joining Sandy Koufax (1963), Don Newcombe (1956) and Dazzy Vance (1924), and the first Dodger overall to win the award since Kirk Gibson in 1988. He is the 11th player in club history to win the award and a Dodger has now been honored as the league’s MVP 13 times, the third most by a National League team behind only the Cardinals (20) and Giants (14). In addition to Vance, Newcombe, Koufax and Gibson, the club’s previous winners are Steve Garvey (1974), Maury Wills (1962), Roy Campanella (1951, 1953, 1955), Jackie Robinson (1949), Dolph Camilli (1941), and Jake Daubert (1913). Kershaw is the first National League pitcher to be honored as MVP since the Cardinals’ Bob Gibson in 1968 and just the fourth NL pitcher in the Cy Young era (since 1956) to win the award. Overall since 1956, only 11 pitchers (eight starting pitchers) have been selected as MVP – Justin Verlander (2011), Dennis Eckersley (1992), Roger Clemens (1986), Willie Hernandez (1984), Rollie Fingers (1981), Vida Blue (1971), Gibson (1968), Denny McLain (1968), Koufax (1963), Newcombe (1956) – with all also winning the Cy Young Award in the same season. Of those, only Kershaw, Verlander and Koufax threw a no-hitter in their MVP season. Kershaw led the Majors with 21 wins (21-3) and a 1.77 ERA in 27 starts, as he became the first-ever pitcher to win four consecutive MLB ERA titles. Kershaw’s .875 winning percentage (21-3) also topped the Majors and was the second-highest mark ever by a Dodger (min. 20 starts), behind only Preacher Roe’s .880 winning percentage (22-3) in 1951. The 26-year-old was selected to his fourth consecutive All-Star Game and additionally led the Majors with a 0.86 WHIP and six complete games, while ranking among the NL leaders in strikeouts (239, 3rd), opponents’ batting average (.196, 2nd), shutouts (2, T-3rd) and strikeout-to-walk ratio (7.71, 1st). The Dodgers posted a 23-4 record in Kershaw’s 27 starts, including a 14-1 mark in his 15 starts of 8.0 or more innings. Additionally, Kershaw was recognized for his all-around contributions by leading the NL (including pitchers and position players) in wins above replacement (WAR), according to both Baseball-Reference.com (led the Majors) and FanGraphs. He led NL pitchers with seven defensive runs saved, according to FanGraphs, and controlled the opposition’s running game, allowing only five stolen bases all year, earning the distinction as a Gold Glove finalist. At the plate, Kershaw batted .333 (5-for-15) with runners in scoring position and tied for fifth among NL pitchers with a .235 on-base percentage. Kershaw’s 1.77 ERA was the lowest mark by an MLB starter since Pedro Martinez posted a 1.74 ERA with Boston in 2000 and the lowest ERA for a National Leaguer since Greg Maddux’s 1.63 mark with Atlanta in 1995. He was the first Major Leaguer to post consecutive seasons with an ERA under 2.00 since Maddux in 1994-95 and joined Koufax (1963-64) as the only Dodgers since 1900 to accomplish the feat. Kershaw, who opened the season with his fourth consecutive Opening Day start and a 3-1 victory over the Diamondbacks at the Sydney Cricket Ground in Australia, has gone 98-49 in 211 games (209 starts) in seven big league seasons. Since his MLB debut in 2008, he leads the Majors with a 2.48 ERA and a .209 opponents’ batting average, posting the lowest career ERA among pitchers with at least 1000.0 innings pitched and 100 starts since the beginning of the Live Ball Era in 1920. 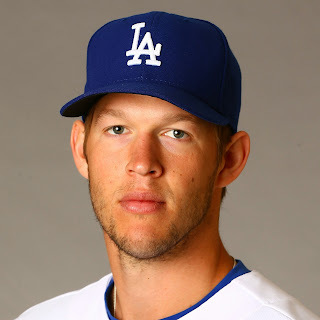 Kershaw was originally selected by the Dodgers in the first round (seventh overall) in the 2006 First-Year Player Draft out of Highland Park (Texas) High School. Yesterday, Kershaw was unanimously awarded his second consecutive and third career Cy Young Award, becoming just the ninth all-time pitcher to win three or more Cy Youngs and also the ninth pitcher to win the award in consecutive seasons. He was previously honored this year with his second-consecutive Roy Campanella Award as the “most inspirational Dodger,” the Players Choice Awards for Marvin Miller Man of the Year, MLB Player of the Year and Outstanding National League Pitcher, a selection as both Sporting News’ and Baseball America’s MLB Player of the Year and the Warren Spahn Award as the game’s top left-hander.